As most of you know by now, I've decided to cook my way through the new year using my almost 100 cookbooks and in return I'd like to share with you my recipe results! If you're not following me on Instagram, you must! I'm sharing my cooking adventures in my insta-stories and giving some of my cooking tips along the way as well! This week I tried four fabulous new recipes and it was SO much fun unplugging from the internet and taking the time to find these recipes. 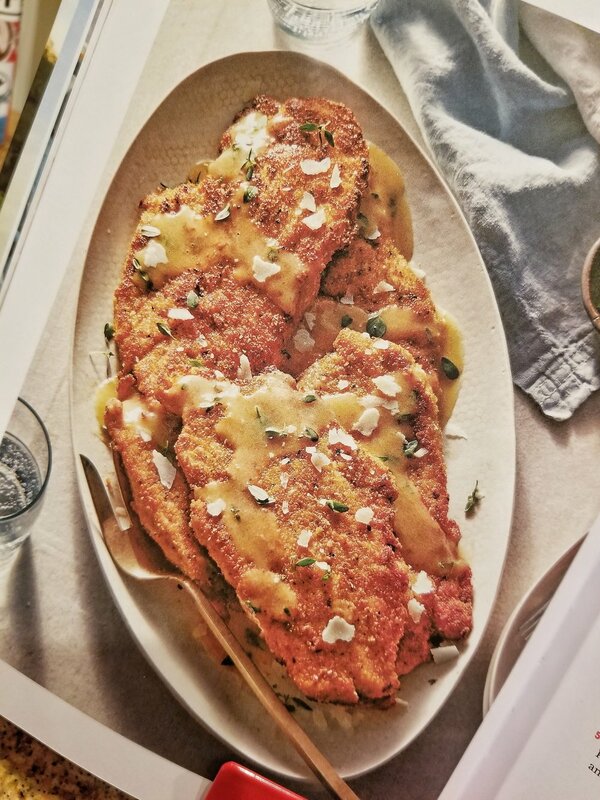 I made Valerie Bertinelli's Chicken with Lemon-Wine Sauce from her cookbook, "Valerie's Home Cooking." I kicked off the new year with this DELICIOUS chicken!! It was a pretty simple recipe and it made a LOT of food! It made enough leftovers for a couple days worth of lunches for me. Since my chicken breasts were so large (haha - get your mind out of the gutter! ), I ended up serving them over arugula and it was perfectly filling. The lemon-wine sauce kind of acted as a dressing to not only the chicken, but to the arugula as well! This is a great weekend recipe because it was little more on the time consuming side, but 100% worth it! I made Ayesha Curry's Salmon Sandwiches with Mango & Asian Pear Salad from her cookbook "The Seasoned Life." This was the perfect recipe to kick off my work week because it was super duper easy, absolutely delicious and that fruit salad was probably something I would've never made on my own! I will let you all in on a secret... I couldn't find Asian pears, and I wasn't in the mood to hunt them down, so I just bought D'Anjou Pears and rolled with the punches! I've had Asian pears before and their a little more crunchier, but hey, whatcha gonna do right!? Ok, so the salad was super quick to whip up, you cook the salmon in oven and while that's going, you butta that bread and make your yogurt spread! It's all quite simple! I used smaller salmon filets and let me tell you, there were NO leftovers, this was gone IMMEDIATELY. Oh, and I don't know about you, but I'm not picky when it comes to mixing my foods, so I would recommend adding a little bit of the fruit salad on your salmon sandwich - it takes it to a WHOLE other level! I made Ham and Ricotta Cannelloni from the cookbook "1 Ingredient, 4 Ways." This cookbook is really neat because like it says, you can browse through, pick an ingredient and it will give you four different recipes you can make using that one ingredient. There's everything in there from appetizers to sides, lunches, dinners and even desserts, you name it! The ingredient I chose to cook with was canned tomatoes because generally you have those in your pantry right? So I thought why not make something I don't normally make on an every day basis. I chose the ham and ricotta cannelloni because A. I love ricotta and can eat it STRAIGHT out of the tub (which I'm sure some of you caught me in the act while watching my insta-story!) and B. anything with meat, cheese and pasta has be good right?! So it was a done deal. This was very a simple recipe to attack, the most you really had to do was wait for your sauce to simmer which was about 30 minutes. Again, this recipe made a ton of leftovers for ME, but if you have a big family, then you're set! It was a pretty light pasta dish in my opinion and tasted like a delicious breakfast pasta - the ham mixed with the ricotta, Mm Mm Mm! **Side note: I added extra cheese on top because why not!? 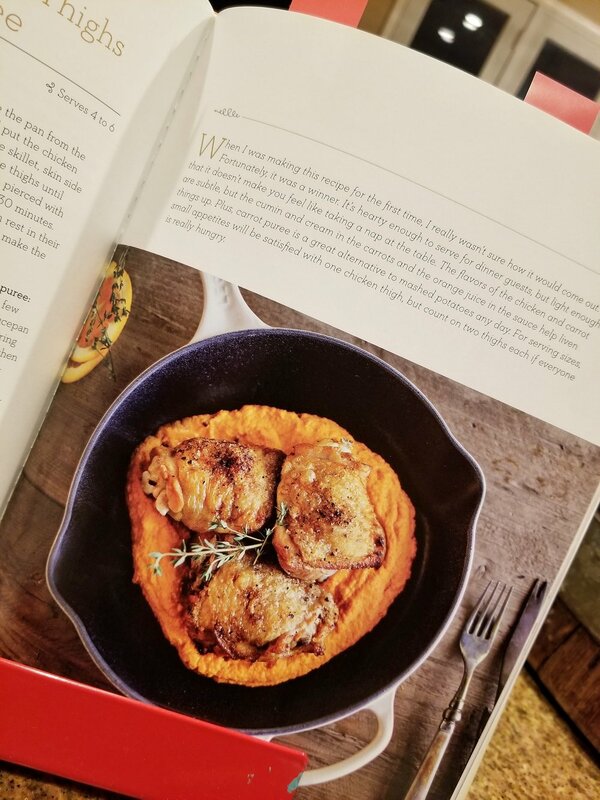 I went back to Ayesha Curry's cookbook and made her Orange-Thyme Chicken Thighs with Carrot Puree. This dish was so tasty, and you want to know my favorite part?! THE CARROT PUREE!! It was unreal! I just wish I would've made more! I had a lot of extra chicken, but no extra puree, so now I know for next time to double the puree portion. Oh! Also, I'll probably use skinless boneless chicken thighs versus bone-in, just a texture preference. The flavor was still perfect! This was an extremely easy meal to prepare, another great weeknight dish! Also, if you're trying to get the kids to eat those carrots, this is it folks! OK friends, that's this week's first four recipes! I kind of decided mid-week that I wanted to do these posts for you guys, so forgive me for the disheveled post! They'll be more organized next time!